On time pick up and delivery. Meticulous service. Guaranteed. Betcha couldn’t read that out loud! Anyway, Black Pug has a new fat bike company on board. Fatback Bikes out of Anchorage, Alaska. Fat bikes is all they do and starting at $1999,00 for an aluminum frame and fork with SRAM GX 1 and tubeless ready tires and rims, or $2,999.00 for the same build on a carbon frame and fork, they offer an excellent package for the price. Fatback. The frame that started the fatbike frenzy. The frame that changed everything in 2007. We didn’t invent the fatbike (that would be Steve Baker, of Icicle Cycles out of Anchorage AK back in 1988), we reinvented it. Using ingenuity, along with a bit of alchemy, founder Greg Matyas developed the holy grail of rear hubs, the symmetrical 170mm (we got your Boost)! This hub design would remain the standard until 2012 when we developed a new symmetrical standard, one which allowed the use of 5” wide tires, the mighty 197mm hub, which the entire industry recognized as the simply the best design to do it all. Symmetrical design, cutting edge geometry (our competitors are now just catching up to what we designed 11 years ago), better stand over, and more tire clearance…just some of the reasons we catapulted the fat bike into the future. In 2006, only the Surly Pugsley was available (there were also a couple of custom steel builders doing one-off frames using different rear hub standard, one of them being Ray Molina, who developed the offset design used by the Surly Pugsley, also used by Wildfire Designs and John Evingson , both local Alaskans), and great as it was, we had other ideas on design and geometry, and produced the first symmetrically designed fatbike, years ahead of our nearest competitors. Our Ti frames had more stand over clearance, more tire clearance, better cable routing, slacker and taller head tubes, longer top tubes, lower bottom brackets, and shorter chain stays, all working in sync to provide the best handling, most confidence inspiring fat bike on the market to this day. Our bikes have more winter endurance wins that ALL other brands combined! We developed more than just frames, forks, and industry drive train standards. We made the first fat, single wall aluminum rims, and, working with Stan’s notubes, we introduced tubeless fat to the world in 2009 with our Uma II rims, capable of running pressures as low as 2psi. Our carbon Footprint rims set the standard for single wall, lightweight tubeless performance. Not the lightest, nor the least expensive, but no other rim comes close to weight, price, and durability. One of our Fatback Ambassadors, nine time US Moto Trials champion Pat Smage, rides trials on the carbon Footprint putting them to the ultimate test of durability. Our original bikes were made of Titanium. We loved the ride of Ti, but they were quite expensive, so we started producing aluminum frames in 2009, and steel frames made of True Temper OX Platinum in 2010. Our first carbon bike, the record setting Corvus came along in 2014 and once again took the world by storm with it’s fantastic handling, lightweight, and beautiful lines, it’s been ridden to multiple records in the world’s toughest events. In 2015 we developed our first “trail” inspired fatbike, the Skookum, with long, low, and slack geometry, suspension corrected for 5” travel fork. This bike brought fat to a whole new crowd-the shredders! Brand manager and longtime industry guru FuzzyJohn, who helped develop the frame says it’s the funnest bike he’s ever ridden. We hear this comment quite often these days. For 2016, using input from the toughest riders in the toughest events around the world, we introduced an all new suspension corrected Corvus with a few geometry tweaks to even further our lead in frame design, as well as offer the first XS size 14” carbon fatbike, and an XL 22” as well. Fatback owner and founder, Greg Matyas says it’s the finest bike we’ve ever made, a culmination of a decade of industry leading design. In February 2014, former pro mtb racer John (Fuzzy) Mylne came aboard bringing a lifetime of expertise and has taken Fatback to unprecedented levels. Our combined knowledge and efforts yields the finest fatbikes money can buy. Find out for yourself why racers and adventurers alike chose Fatback. 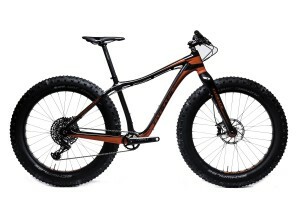 If you care to read about Fatback Bikes updated Corvus…. Oh, and by the way, 2018 product will be posted after things here at the shop slow down in January or February. Thank you all for your business! One more fat bike in the mix. Niner Bikes Demo Presented by Black Pug Bike Repair! Preseason Niner order happening now! Chris really knows his stuff, and goes above & beyond- doing things not asked for. He fusses over my bike every time he touches it. He's absolutely THE BEST. They offer quick repairs at reasonable prices. I can count on them to fix my bike as soon as possible. They take care of their customers. They also give really great advice when it comes to anything bike related. Went to Chris on a recommendation from a close friend. I was hoping to piece together my first new road bike with modern components. Chris shared 4+ hours of his time and beer to speak with me, finding out exactly what I was looking for. He pieced together my bike and built up a beautiful ride that I will enjoy for years to come. If you're looking for a great human being to start or enhance your cycling life, pull your jeans up high and tight and go see Chris!